Part of the nervous system formed by all the motor or sensory nerves (43 pairs) connecting the central nervous system to the organism. Branch of the tibial nerve ensuring nerve sensation especially to the outer part of the calf, the ankle and the heel. Branch of the sciatic nerve extending through the posterior tibial nerve and providing nerve sensation to certain muscles of the leg and the sole of the foot. Branch of the sacral plexus ensuring movement in part of the buttock (greatest gluteal muscle) and sensation in the posterior part of the thigh. The lower gluteal nerve (originating in the posterior cutaneous nerve of thigh) and the upper gluteal nerve (branch of the sacral plexus) provide nerve sensation to the greatest, medium and small gluteal muscles. 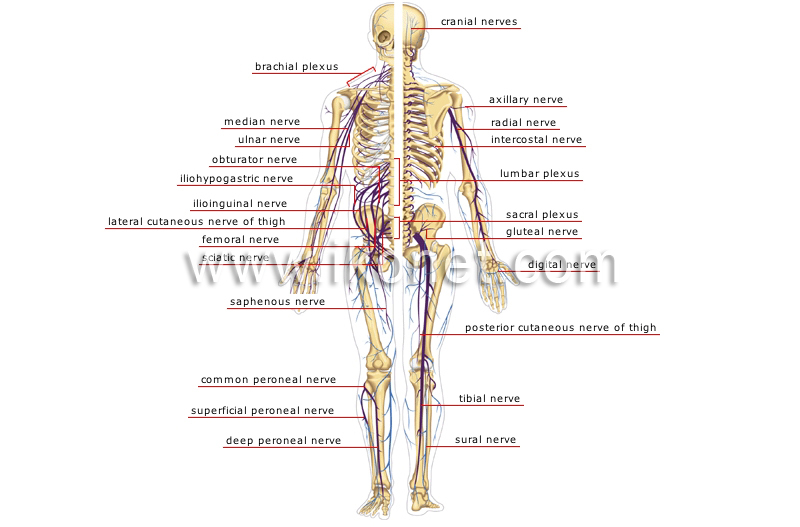 Nerve originating in the brachial plexus ensuring nerve sensation in the fingers of the hand. Network formed of several nerves whose branches ensure movement and sensation in the buttock and part of the thigh. Network formed of the first four lumbar nerves whose six branches ensure movement and sensation in the lower limb. Nerve ensuring motor function and sensation in the muscles between the ribs, as well as in a portion of the diaphragm and the abdominal wall. Branch of the brachial plexus providing nerve sensation especially in the extensor muscles of the upper limb and fingers. Branch of the brachial plexus providing nerve sensation especially in the deltoid and small round muscles; it also ensures sensitivity in the shoulder joint. Each of 12 pairs of nerves connected to the brain providing nerve sensation to the head and neck; they serve a motor or sensory function. Branch of the common peroneal nerve ensuring nerve sensation mainly in the muscles of the anterior part of the leg and the back of the foot. Branch of the common peroneal nerve ensuring nerve sensation mainly in the lateral peroneal muscles of the outer leg and the back of the foot. Branch of the sciatic nerve ensuring nerve sensation especially in the muscles of the anterior and external parts of the leg. Branch of the femoral nerve ensuring nerve sensation in the inner leg and knee. The organism’s largest nerve, originating in the sacral plexus, ensuring nerve and motor sensation in a large portion of the lower limb. Large branch of the lumbar plexus ensuring nerve sensation especially in the flexor muscles of the thigh and the extensor muscles of the leg. Branch of the lumbar plexus ensuring nerve sensation mainly to the buttock and the outer thigh. Branch of the lumbar plexus that, along with the iliohypogastric nerve and the lateral cutaneous nerve of the thigh, provides nerve sensation to a portion of the abdomen, the genital organs and the thigh. Branch of the lumbar plexus ensuring nerve sensation in one section of the abdominal wall and in the genital organs. Branch of the lumbar plexus providing nerve sensation especially to the abductor muscles of the inner thigh. Branch of the brachial plexus providing nerve sensation, with the median nerve, especially to the flexor muscles of the hand and toes. Branch of the brachial plexus providing nerve sensation to various muscles in the lower part of the forearm and part of the hand, where it divides into five branches. Network formed of the last four cervical nerves and the first dorsal nerve whose branches ensure motion and feeling in the upper limb.